The other day I was wanting to make an impromptu dinner for friend who was coming over. Tomato Soup and Grilled Cheese sandwiches sprung to mind, probably in part because I had an abundance of tomatoes that needed to be used and had just bought a pound of Cheddar cheese from Saxelby Cheese. I’ve made tomato soup many times in my life, still now with the ease of search the net whenever I go to make something now I do a search online to see what new and creative things people are doing with tried and true traditional recipes? Well if my search for a good tomato soup recipe is any indication the answer would be: nothing. Unless you consider gratuitously adding chicken stock to it is a good idea. I don’t and here’s why: tomatoes have a ton of flavor and and good tomato soup is a perfect simple inexpensive dish that requires very little else but tomatoes, oil, onions and maybe some herbs. So why add chicken stock, first off you take soup which could be good for your vegetarian friends and make it into a meat product – WTF? Then there is the expensive of buying chicken stock or if you were me, making it and lastly there is the environmental impact. So why is it the first what 12 recipes I saw online for Tomato Soup all called for Chicken Stock? From the Food Network to Martha Stewart to Garden Fresh Tomato Soup at AllRecipes.com (look honey I picked some fresh chicken stock from the garden this morning…) it’s chicken stock tomato soup all the way. One might wonder why they aren’t forced to call it Chicken Tomato Soup. And don’t get me wrong I love chicken, I just hate how ubiquitous and wasteful it is to use it where none is required. Makes me also think that these recipes are all calling for an ingredients because it is good for business, I mean asking people to use a cup of water in a soup isn’t going to build ad revenue. Thankfully you read Urbanfoodguy where I don’t make any add review and can post a Tomato Soup recipe that relies on …tomatoes for flavor. Here in the NorthEast US of A we are rapidly coming to the end of tomato season and if you are anything like me your kitchen will be overflowing with tomatoes you bought at the market and now are wondering what to do with. This soup is great for a large group, taste good after a few days in the fridge, can be tarted up in any number of ways and if you have too much to deal with freeze it so on the first day of Winter you can heat it up and remember what Summer tastes like. In a large heavy bottomed stock pot add: 2 Tablespoons of butter and 2 Tablespoons of Olive oil, over medium high heat cook until the butter melts then add 1 large roughly chopped onion, 2 large shallots roughly chopped and a little salt, cover and cook until translucent and soft – about 10 minutes. Add 2-3 cloves of finely chopped garlic, stir and cover for 2 more minutes. Add a generous 2 pounds of cored and chopped tomatoes (I used a combination of cherry tomatoes and beef stake, feel free to use any kind of you have), 1 Bay Leaf and 1 tablespoon of rice (I used brown basmati – any kind should do the trick) and 1 stem of Basil – stem included. (You can use any herb you like Thyme, Rosemary, Savory or none. Ideally the soup should just be redolent of the flavor of fresh tomato – if you want to add an herb touch I suggest a swirl of pesto just before you serve it, or even better yet leave the pesto in a bowl and let your guests decide). 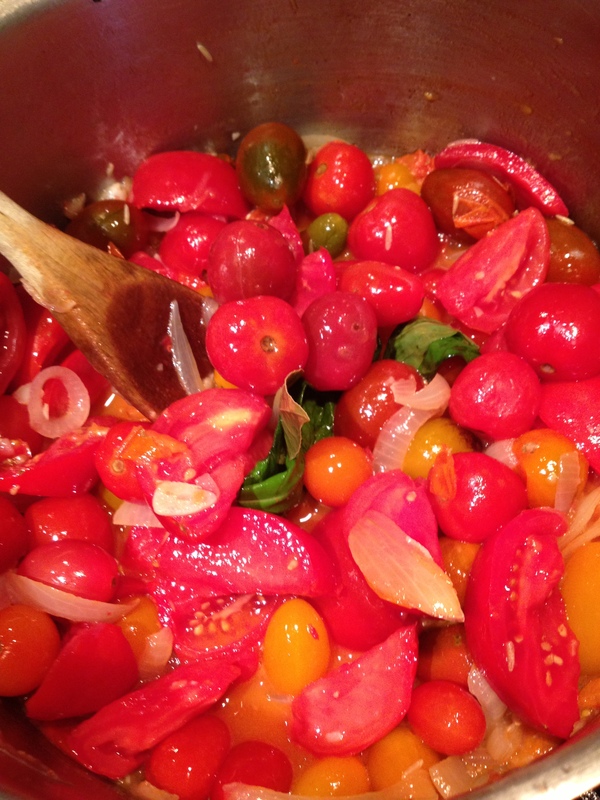 Cover the pot and cook until the tomatoes start to melt – another 10 minutes. Stirring occasionally. Add 1 cup of water, some more salt to taste and another Tablespoon of butter cook another 10 minutes then take off the heat. Remove bay leaf and herb stem and let cool. While it is cooling place a fine mesh sieve over a large bowl. 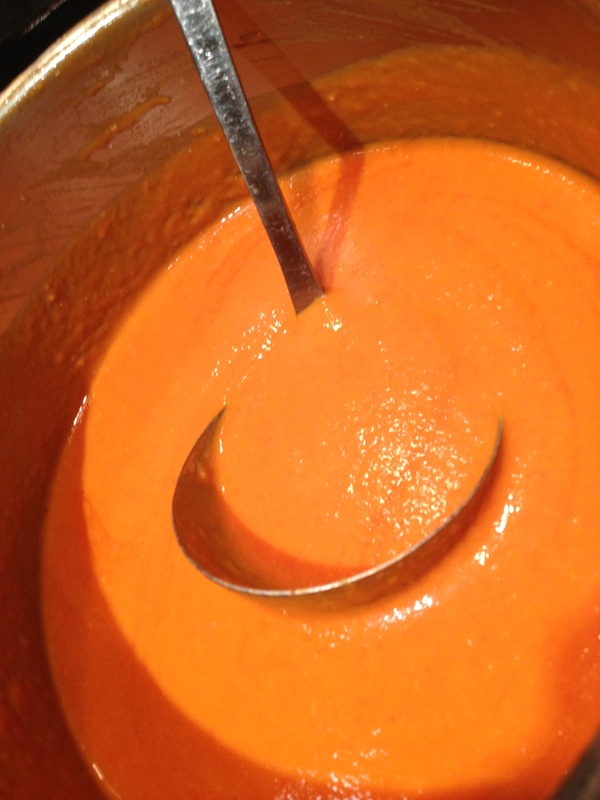 When the soup is cool enough to handle spoon it into a blender (a food processor works but a blender is best) – this may require several batches as you don’t want to over fill your blender. Process at high speed liquify. 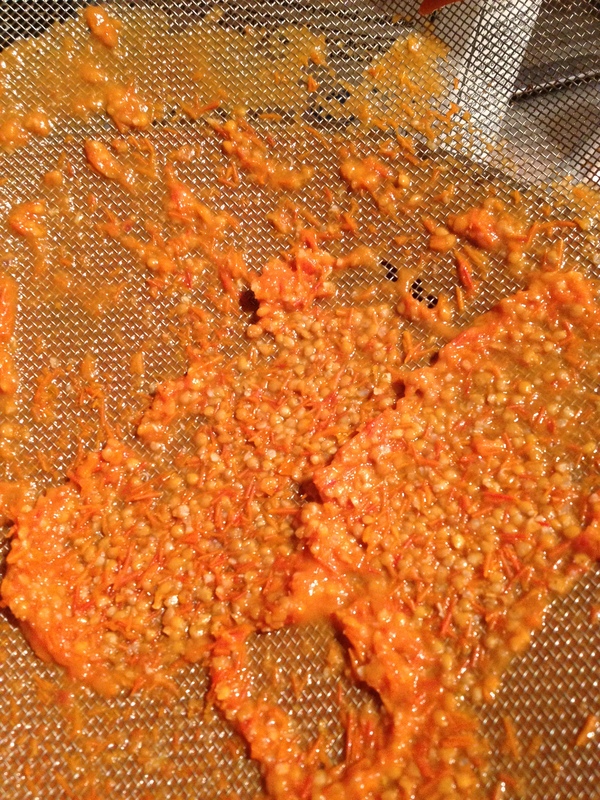 Pass through the sieve – repeat until all the soup is processed. It amazes me that even though you have just blended the hell out of this soup the seeds remain in tact: ergo the need to blend. Heat the soup, taste and season with salt, white pepper or ground black pepper (if you don’t mind seeing little black flecks) or even a pinch of cayenne. Garnish with pesto, grated parmesan, olive oil and croutons…shredded basil…crumbled blue cheese and bacon and freshly chopped tomatoes….so many options, but for me it’s best served plain with grilled cheddar cheese sandwiches. This entry was posted in Politics, Recipes and tagged allrecipes.com, grist.org, martha stewart, recipe, The Food Network, Tomato Soup, vegetarian. Bookmark the permalink.